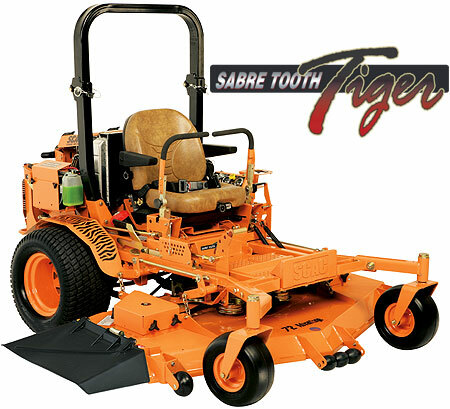 The Scag Sabre Tooth Tiger was introduced to fill the need of professional landscapers. A large, powerful commercial-grade mower, it has the durability to withstand the abuse of daily wear and adequate power to complete the job in record time. With quality, innovative and durable components, the Sabre Tooth Tiger raises the bar for turf care equipment manufacturers across the country. A liquid-cooled Briggs Vanguard turbo-charged diesel engine produces 31 HP easily tackling the job at hand. Mated with the newly designed Velocity Plus cutting deck, the Sabre Tooth Tiger delivers the ultimate in power, precision, and performance. The high velocity deck with the redesigned Turbo Baffle, discharges grass clippings farther and wider evenly. Heavy-duty blade spindles and tapered roller bearings help to give the Velocity Plus deck maximum performance leaving a beautifully manicured lawn, even at fast ground speeds. Operator comfort is not sacrificed for the sake of power and performance. The Command Comfort station includes an adjustable suspension seat, fully adjustable steering control levers, and an adjustable deck lift/height pedal. Operators face less fatigue and have maximum and convenience on the job. ScagOEMParts.com stocks most replacement parts for the Sabre Tooth Tiger. Find and order parts quickly and easily with the online parts search tool.